Nutanix is gobbling Netsil, a startup that develops tech for the discovery, mapping and management of microservices in distributed cloudy spaces. So why is Nutanix making this move? It builds hyperconverged infrastructure appliance software which itself provides a system customers use to run applications. Today these are largely virtualised but they are becoming containerised as sets of microservices. These containers form and reform dynamic chains as they are instantiated and run and interoperate. Where a virtualised application might use 10-50 VMs, a containerised one could use 25-100 microservices, or even more. Diagnosing and fixing a misbehaving containerised app is far more complex than problem fixing at a VM-level. Netsil provides a way of automatically mapping the containers and their interactions, and wants the world to compare it to a Google Maps for cloud apps, one that helps alleviate performance bottlenecks. Auto-app mapping by Netsil's Application Operations Center (AOC) technology builds a topology map that lists all internal and external services, and inter-service dependencies. It can monitor particular signals for service health using real-time metrics from the entire application stack. The technology requires no code mods to existing apps and nor does it add any performance overheads, Netsil has said. 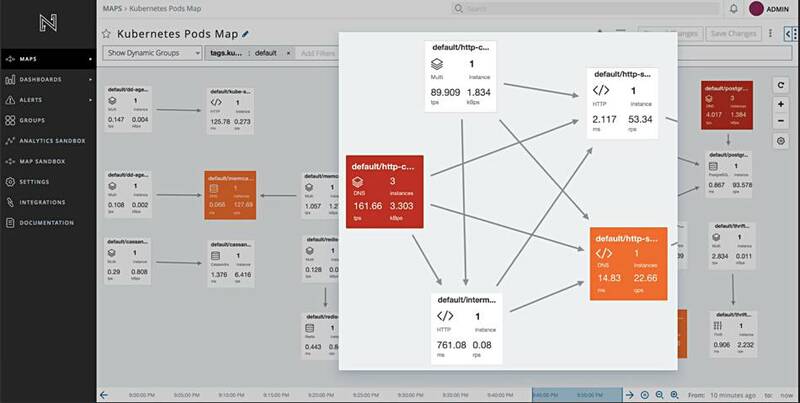 System reliability and dev/ops engineers can use the AOCs auto-discovered maps and analytics for incident response, capacity planning, deploy management, and helping to deliver uptime and performance service levels. For Nutanix, looking at a future with micro-services operating in its Enterprise Cloud OS software environment, Netsil gives it microservices application mapping, performance management and problem fix help.